Young women donors today are holding their own when it comes to charitable giving, bucking the trend of Millennials and Gen Xers being less generous than their predecessors, according to the newest report in the Women Give series released today by the Women’s Philanthropy Institute (WPI) at the Indiana University Lilly Family School of Philanthropy. Findings from the study, which is funded by a grant from the Bill & Melinda Gates Foundation, have implications for donors and fundraisers alike. Conventional wisdom says younger generations—Millennials and Gen Xers—are less generous than their predecessors. However, a closer look reveals that giving by young single women Gen Xers/Millennials is holding steady compared to their counterparts 40 years ago; giving by single men and married couples, on the other hand, has dropped. 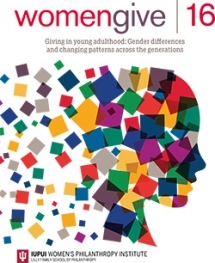 The Women Give 2016 report investigates how charitable giving has changed across generations, given that women’s roles within the family and within society have changed. To do so, this study compares young adults across two generations: the pre-Boomer generation, also known as the Silent generation, when they were young adults four decades ago; and Generation Xers/Millennials, who are young adults today. The report compares charitable giving patterns of single men, single women, and married couples, and it also looks inside marriage at the role of husbands and wives. Decision-making styles about charitable giving have shifted over time. The percentage of GenX/Millennial couples in which women influence charitable giving has grown, compared to pre-Boomer couples, as has the level of giving by those woman-influenced couples. Compared to pre-Boomers, GenX/Millennial married couples where the woman has an influence on the household’s giving tend to give higher amounts than when the man alone makes giving decisions. Women Give 2016 is the seventh in a series of signature research reports conducted at the Women’s Philanthropy Institute that focus on gender differences in giving to charitable organizations. Previous reports have examined differences between adult male- and female-headed households, looking at gender differences in charitable giving across income levels, marital status, age/generation, and types or charitable organizations receiving the giving. The Women Give studies have also assessed whether the gender differences observed in adult charitable giving begin to emerge at younger ages and how sons and daughters affect parents’ charitable giving. Women Give 2014 investigated the nexus of religiosity, gender, and giving. These reports increase our understanding about how gender influences philanthropy. The Women’s Philanthropy Institute increases understanding of women’s philanthropy through rigorous research and education, interpreting and sharing these insights broadly to improve philanthropy. By addressing significant and groundbreaking research questions and translating that research into increased understanding and improvements in practice, WPI helps to leverage new and expanded resources for the common good. Follow us on Twitter @WPIinsights and “Like” us on Facebook.